For one year every customer who bought a CatBib was offered the chance to take an anonymous survey. Over 600 customers took the optional survey. The results are organized into similar groups of answers followed by numbers of answers, with the most often given answers at the top. Thanks to all the environmentally concerned cat-owners who participated in the customer survey and thanks for keeping all those wild birds safe. Why do you let your cat outside? The top answer was cat health. Exercise for physical health and pure enjoyment for their mental health. The health of their cat means a lot to cat owners. Just the opposite of what the keep-your-cat-indoors-crowd are always telling us. Was originally indoor only, but escaped. Had a bite at the apple and has been impossible ever since. He enjoys it and studies show cats have fewer urinary tract disorders (FLUTD) when allowed outside access. They can’t get enough exercise playing in the house with us dangling a string. He loves it and goes nuts if he is only inside (e.g. last time he was locked in for a few days, he popped a therapy ball while I was sitting on it). On a more philosophical note, my other cat, Matthew, seems to be more cat-like now that he goes outside. How long do you allow your cat outdoors? One third of the cats had unlimited access to the outdoors, but two-thirds, the great majority of the cats, had restricted outdoor time. The real reason here was how little time outdoors many cats will agree with. Some freedom (1 to 8 hours) is enough to satisfy many cats. Do you lock your cat in at night? YES – 304 definite yes. Most cats owners lock their cats in at night. Personally I lock my cats in at night because then I have the time to socialize with them in the evening. Many wild animals, such as raccoons, skunks, coyotes and owls are active at night. Drivers may not see the cats as well at night. Have you tried to keep your cat indoors? 411 cat owners(70% of total responses) tried to keep their cat indoors. 110 cat owners have not tried to keep their cats indoors. What happened when you tried to keep your cat indoors? She howls, scratches the furniture, pushes things off the tables, climbs draperies, writes her Congresscat. Yes. She cried incessantly all the time for days and weeks. She sat by the door and scratched at the door and cried and screamed a mournful cry. Until we found this solution he had to be on meds to keep him less aggressive toward people and animals. Now he’s off the meds and is a very happy kitty. For the first year I did, and he hated it. He got aggressive and destroyed everything he could. Toys were unsatisfactory. As you can see by the chart, by far the most aggressive cat age is TWO years old. This is the age most often in need of a CatBib. After THREE years of age, the killing urge may decline or they get slower. The CatBib can usually train many cats not to hunt, because they get so discouraged and out of practice….no fun anymore. 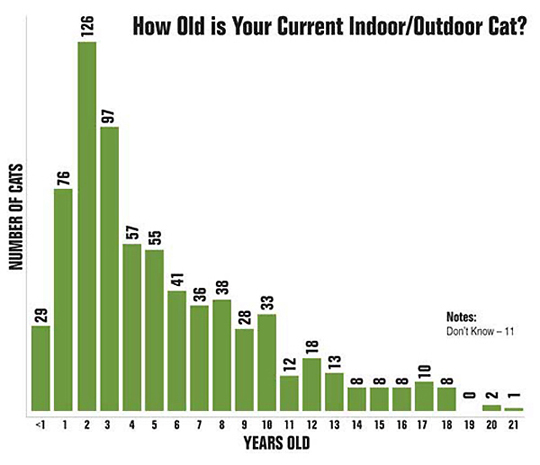 If you had previous indoor/outdoor cats, how old did they get to be? 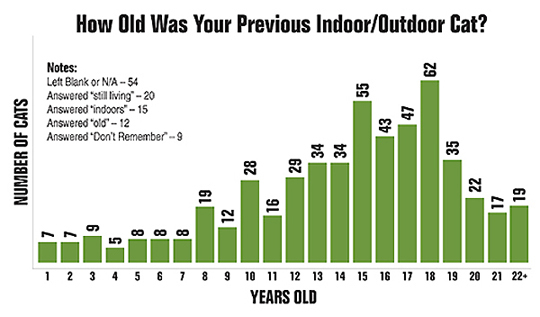 The average age of indoor/outdoor cats in this survey was 14.7 years. * 4% die before age 5. * 34% live 7-14 years. * 57% live 15-25 years! * AND a full 30% live 18-25 years. The lesson here is to buy geriatric cat health insurance for your indoor/outdoor cat. Why did you choose a cat? Many interesting and thoughtful reasons given for choosing a cat. This is why cats are the number one pet in the USA and the UK. Words fail me. They are fascinating, entertaining, completely original. Amusing. Aggravating. Life is not complete without a cat! Very loving animals, full of beans. Any comments or details you would like to share? I’ve had a total of thirteen cats since I left home over forty years ago. Out of all these cats I have previously only had one cat that’s hunted birds or mammals. I don’t believe the fact that indoor cats live longer. As I said before our two other cats lived into their 20s and they were outdoor cats. Granted our cats rarely chose to go outside during the winter and never on a rainy day, but they do spend most of the summer on the deck enjoying the sun with us. I feel as I am being attacked for having cats. 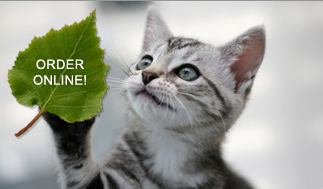 I am a small animal veterinarian and advocate owners keeping their cats indoors. However I see many cats with chronic recurrent urinary tract inflammations and other stress disorders. The latest information (I just heard a lecture at the Atlantic Coast Veterinary Conference) links emotion, stress and physiological problems. Most definitely indoor cats have more of these which may lead to FLUTD’s(Feline Lower Urinary Tract Disorders), indoor spraying, furniture destruction and end up in euthanasia for some of them. My cats just love going outside and being cats. Fortunately none of them are hunters, although I would put bibs on them if they were and will recommend them to my clients. At this point unless I can decrease my young male’s aggression toward the older one, we will need to find a new home for the young bad boy. Currently we are using pheromones, distraction and sanctuary for the older one. I will probably start clomipramine next.